A few months ago, Apolitical surveyed 7,000 public servants in 97 countries, and found that the number-one thing they believed would improve their work is opportunities to network with innovators. As What Works Cities (WWC) rapidly approaches its third birthday — April 20th, 2018, mark your calendars, ladies and gentlemen! — we have had the pleasure of building an extensive network of local leaders and global experts actively sharing best practices for outcomes-focused government. 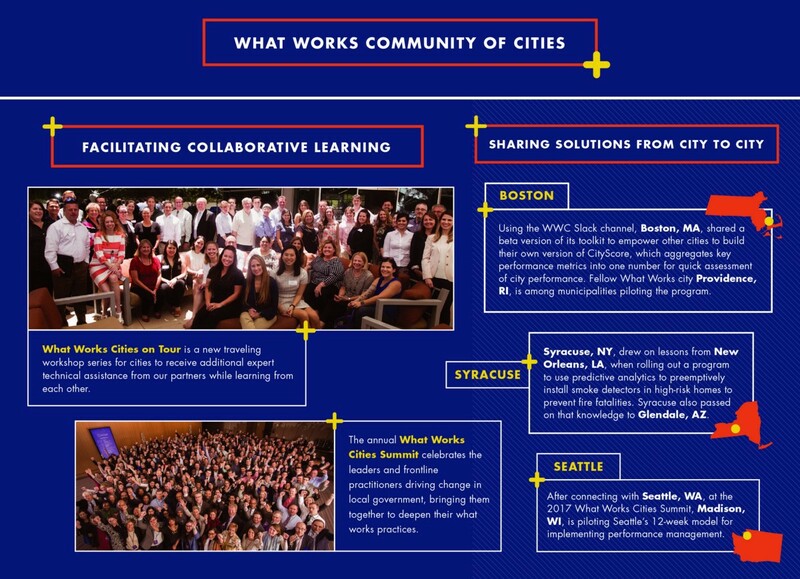 Members of this network — our What Works Community of Cities — are replicating one another’s successes and gleaning valuable insights from each other’s challenges. One of the ways they’re doing this is by coming together to exchange ideas and learn from one another. Last week, over 60 participants from 16 cities joined us in Charlotte, NC, for the third stop in our traveling workshop series, What Works Cities on Tour. 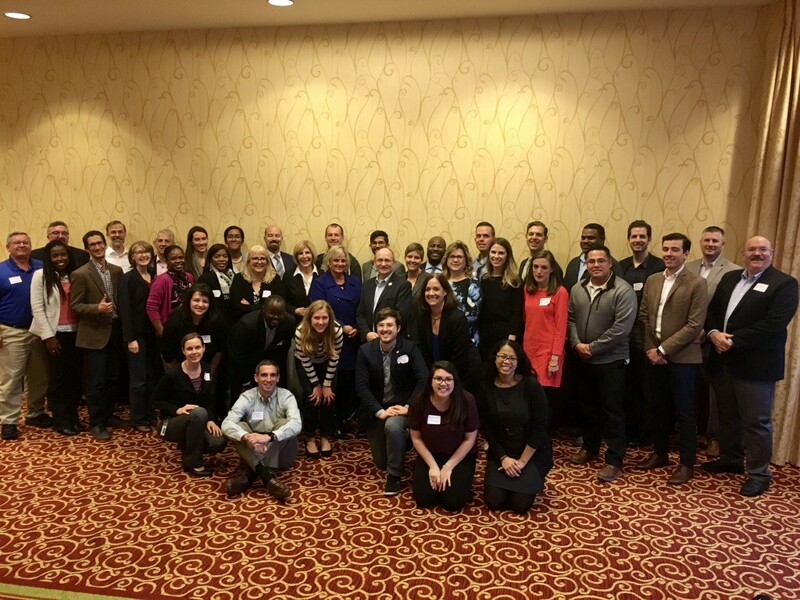 The workshop in Charlotte had a wide range of participants — from analysts to elected officials, coming from host city Charlotte all the way to Anchorage, AK — who had the opportunity to learn from all five of WWC’s expert partners. As I walked around from session to session, I noticed a key value that emerged in each: Be intentional. When applying behavioral science to a specific policy or practice, be intentional about your desired outcome. Michael Kalin taught participants how to apply the Behavioral Insights Team’s EAST framework (making your messaging Easy, Attractive, Social, and Timely) to create and test which types of messages are most likely to achieve an ideal outcome behavior from residents, such as enrolling in a service or paying an outstanding fine. When scoping a new data project, be intentional about the pieces you need in place for the project to succeed. Miriam McKinney and Matt Pazoles from the Center for Government Excellence at Johns Hopkins University shared that the best data projects have a potentially solvable, challenging, and important problem bolstered by a capable team equipped with the appropriate data. Make sure to engage the partners and stakeholders who will be impacted and obtain their perspectives along the way. When assessing the effectiveness of procurements, be intentional about the performance you expect your contractor to achieve. Jennifer North from the Government Performance Lab at the Harvard Kennedy School said, “So often contracts are renewed year after year without anyone ever asking if the contract is doing what we hoped it would do.” But by defining your goals, measuring your outcomes, and incentivizing appropriately, you will develop a stronger procurement and, in time, a better partnership that serves your residents and uses your tax dollars most effectively. When communicating your stories, be intentional about finding the right message-carriers, and developing a narrative that explains how your city’s data work impacts real people. Kristin Taylor from Results for America reminded the group that, when you focus on creating an ongoing dialogue, and not just sharing your biggest wins, you tell stronger stories and build trust with the public. When crafting your approach to sharing city data, be intentional about designing for the specific user personas that are requesting information. As the Sunlight Foundation’s Stephen Larrick said, “Not all data is usable to all people. If you design for everyone, you end up designing for no one.” Sunlight’s Tactical Data Engagement approach gives cities the tools to empower residents with data, make transparency more effective, and develop a stronger relationship between communities and governments. In other words, if we are intentional about who we want to serve, who needs to be in the room in order to do so, and our intended outcomes, then, in turn, we can be strategic about how we test and develop projects, release information, tell stories, and, ultimately, how we continue to improve the lives of the residents who call cities home. That last goal is certainly what united everyone in Charlotte. After organizing several of these WWC in-person learning opportunities, I can tell you that there’s some kind of magic that happens when public servants share a space. A flame is lit beneath all our feet when we hear firsthand how our community and our peers are succeeding at serving their residents as efficiently and effectively as possible. Reach out to the innovators you have met at previous WWC events and activities. It’s never too late or been too long! Continue sharing your challenges and solutions with one another. And lastly, be intentional at every step along the way to ensure that programs, projects, contracts, and communications are doing what you hoped they would for the people you’re trying to serve. Together, our Community of Cities can continue sparking intentional change from purpose-driven practitioners and leaders from across the country. Madeleine Weatherhead is a program assistant at Results for America. She provides What Works Cities with programs and experiences that meet the learning, networking, and development needs of the What Works Community of Cities. Helping leading cities across the U.S. use data and evidence to improve results for their residents. Launched by @BloombergDotOrg in April 2015.